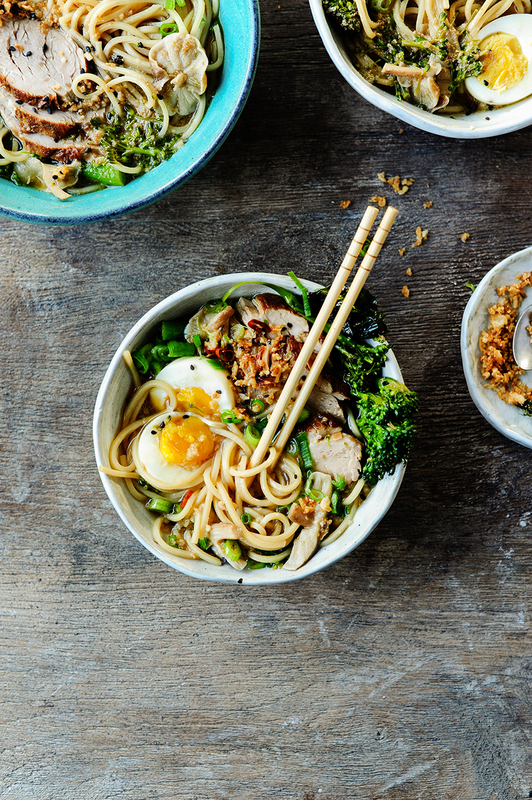 If you love to finish your day with a lot of flavor, then you might like this easy pork ramen for dinner. It’s more than just another Japanese dish, it’s for many a new obsession and lifestyle, great in all its flavors. With this recipe I would like to share with you my obsession with ramen so that you can also serve this Japanese soup at home and slurp it straight from the bowl with an incredible enthusiasm. The most important ingredients for a tasty recipe are broth, spices, ramen noodles and toppings, and I use them with respect for my obsession, with a bit of grace and ease. In this ramen you’ll find a lot of garlic, a piece of pork tenderloin braised to softness, then blended with vegetable broth. This broth is flooding a bowl laid with springy ramen noodles, and on top, thinly sliced shiitakes, a runny soft-boiled egg, toasted nori sheets and finely diced scallions. Have fun! Heat the oil in a skillet and brown the tenderloin on both sides. Add the rest of the ingredients, season with salt and pepper and add water. Put the lid on and simmer for 60 minutes or until soft. In the meantime, heat the oil in the pot, cook the garlic and shallot until soft. Stir with shiitake and the rest of the dry ingredients, season with salt, pepper and soy sauce, add the broth and bring to a boil. Add broccolini and cook for 5 minutes. Then add tahini. Bring a large pot of salted water to boil and cook the ramen noodles according to instructions. Drain well and divide into two bowls. Finely slice the pork tenderloin and arrange over the top, along with a soft-boiled egg and dried nori. Add broth with broccolini and shiitake, sprinkle with diced scallions and roasted onions, serve immediately. Enjoy! I can’t wait to try this ramen recipe, Anna! Looks absolutely stunning! Will report back! What good looking bowls. It’s like a hug in a bowl. Perfect for the winter months. Oh Anna, this looks incredible, and reading the ingredients and method I can see that it is just layers and layers of flavour. Japanese is my favourite food. I’ve been several times for work and it is a place I could see myself living, if I only I could speak Japanese! Love ramen and I have never made it at home (the shame) this looks delicious and your photos stunning as always. Yum! This looks incredible! I love pork and noodles and can’t believe I haven’t had ramen before. I’m going to pin this to try soon!